I guess I hadn’t given much thought to the weather. I heard something about snow coming, but it was far from top of mind as I headed out that Saturday morning for an all-day event at the New England Speaker’s Association. She did say, however, that due to the coming storm, we’d be ending early, at mid-day. It didn’t look too bad when I got out to my car at 12:30; just a couple of inches to clean off. The highway, though, was a different story. The road was very wet and slippery. And even though the average speed was only about 30 miles per hour (that’s 86.5 farthings per haggis, for those of you on the metric system), it felt very unpredictable. So I got off the highway, figuring it would be more controlled and safer on a secondary road. Big mistake. It was even worse. Cars sliding all over the place; I passed two separate accidents in the space of five minutes. An hour later, still driving as carefully as I could manage, I found myself unable to get up a short but steep hill. I tried all of my New England snow-driving tricks. I downshifted to second gear, and then first. Nothing. I turned the wheels all the way to either side, in the hope of finding more traction. That didn’t work either. My wheels just spun in place; I was soon sliding slowly backwards, like a portly pig on a greased maypole (or whatever). Fortunately, there was another guy having the same problem. I got out and pushed him and then he got out and pushed me, and we both made it up the hill. Thirty, white-knuckled minutes later, I finally pulled safely into my garage. Here’s the interesting thing. Yesterday afternoon, I drove that exact same route home. Except this time it wasn’t scary, it wasn’t dangerous, and it wasn’t difficult. Same driver in the same car on the same road. But without the snow, a completely different experience. I spend a fair amount of time helping solos and small businesses market themselves better. Improving their web sites, writing their newsletters, developing their offerings, coaching them on how to leverage their existing relationships. It’s all important stuff, but … it only works if the “weather” doesn’t get in the way. If nobody wants whatever it is you’re selling, I don’t care how good your marketing is or how experienced and capable you are relative to the other guy. If there’s no demand, you’re not going to get much traction. Strong demand, on the other hand, makes life wonderfully easy. Have you noticed, for example, that Bruce Springsteen doesn’t do much advertising? They just announce the concert date, open the door, and people come rushing in. I don’t know what’s on his LinkedIn profile, but I’m pretty sure it doesn’t matter. Here’s the bottom line. I love marketing. And done well, I’ve seen it change people’s businesses from loser to winner. But for it to succeed, it requires somebody (preferably, a whole lot of somebodies) to want whatever it is you are selling. Your job, therefore, and before you get too caught up in how you describe and promote your work, is to first make sure that there’s a real need out there. And if there isn’t, to reconfigure your offerings to line up with existing demand. Can you succeed without high demand? Sure. You can drive 20 miles in a snow storm too. But given the choice, I’ll take clear weather any day. What’s the worst weather you’ve ever driven in? Would you believe me if I told you that the guy who helped me push my car was Bruce Springsteen? Are you calling me a liar? Discuss. My wife and I were driving from Texas to Utah along Interstate 40 during a ice/snow storm in February. An hour after entering New Mexico, officials closed the freeway and diverted traffic into the mountains toward Santa Fe. Someone actually thought that leaving relatively flat freeway and heading into the mountains during the storm was a good idea. I passed over 40 slide-offs, overturned cars, and accidents during that little detour. You may have helped Springsteen – since I’m sure you were both bundled up, he probably didn’t realize he’d helped the famous Michael Katz either. Yikes, Allen, that is a scary story. And you’re right about Springsteen. He’s probably been boring band members all week with his story of how he met me! Simple message, yet so important, Michael. Just shared this post far and wide. You are the man, Steve. Thanks as always for spreading the word. I would not believe you. But I am wondering if you read Bruce’s autobiography? Discuss. Also farthings per haggis is the funniest thing I’ve read all day. I’m actually about halfway through his bio. I’m a sucker for rock and roll history stories, so I like hearing about how he got started. My favorite parts are first meetings he had with now well known people, when they were both starting out. Love your “Bad weather = Lack of demand” analogy. Worst weather/driving for me: I lived in Boston in the early 1980s and was visiting my parents in Western Mass. I heard about a snowstorm coming and decided to leave late one night to “beat the snow.” By the time I got on the Mass Pike it was nearly white-out conditions. 20 MPH with semis passing me and kicking up slush. It took me about 6 hours to make a usually 2.5-hour journey, white-knuckled all the way. No opinion on Springsteen. But another great point about how he doesn’t have to do much to sell his concerts, and how aligning your offerings with customer need makes all the difference. That’s a scary one too, Audrey. Mine was more of a “hope I make it home without denting my car” than worrying too much about my actual safety. But not fun either way! 1. It’s been a hellacious winter with one white-out blizzard after another here in Eastern Oregon (the high-desert part that nobody knows about). I’ve been very happy that I work at home. 2. Nope, not unless you show me a picture or a signed affidavit. How do we know if our niche is marketable? Is that a silly question? We don’t all have minds for cell phones, software, or other techie stuff. Or financial stuff. I may be in big trouble. 1. Sounds like yours has been tough. Pretty mild for us here in Boston, so far. 2. Ah… he had to rush off to a concert or something. 3. I appreciate your honesty. On the marketable question, it’s reading what’s out there and talking to people as best you can. If nobody is talking/writing/asking about the kind of work you do, that can mean you’ve got a nice niche, but it can also mean that there’s no market for it. 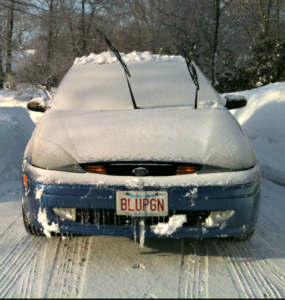 The worst weather I ever drove in was … when I lived in Boston. I don’t do that anymore. Probably a good idea. Driving here is crazy even in good weather! Reflecting on my own (former) solo practice, I now start thinking that all my many and varied efforts to communicate my value were merely just me shouting at different volumes. I think it important when a practitioner thinks about reconfiguring their options they consider breaking out a small subset of what they do as the lead offering. The entrepreneurs we seek to serve, blessed are they, are not always fluent in the language of business. But tactical, beneficial steps are more likely to resonate and give the service provider an entree to demonstrating more expansive value. We tend to get caught up in how we describe what we do (“different volumes”), which is important. But sometimes the problem is the thing we’re offering, more than it is the description of it. Worst weather: Like you, a New England snowstorm. I drove my son, who had strep throat, though a raging blizzard, almost getting killed by monster plows, only to find that the doctor’s office was closed. Then we drove back home. White knuckles doesn’t even begin to describe it. And wouldn’t you know it, just as Bruce and I were taking that selfie, a big plow came by and crushed my phone. Or maybe a dog ate it. Or something. Excellent newsletter, this time. Thank you!